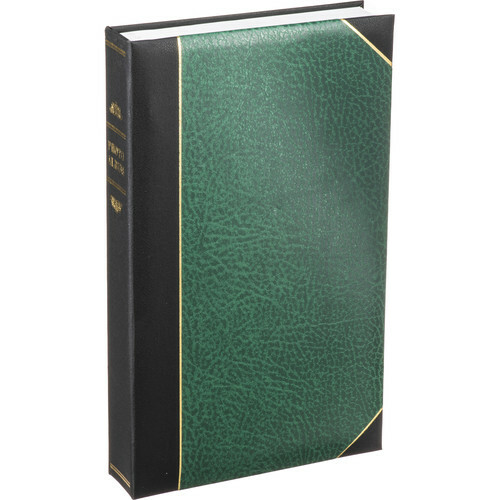 The Pioneer JBT-46 Ledger Bi-Directional Le Memo Album features a two-tone hunter green leatherette cover with corner accents and is designed to display and protect up to 300 4x6" photos. The 3-up style pages can display three horizontal images or two vertical images, or one horizontal and one vertical image per side. It will also accommodate one 4 x 10" APS panoramic photo per side. The 50 clear, side-loading pages protect your photos from dust and fingerprints. The shaded paper background on each page enhances the presentation of your photographs. The book-bound binding enables the open pages to lay flat for quick loading and optimal viewing. There is a memo area next to each photo. The words "Photo Album" are imprinted on the spine. The album is acid-free for long-term archival photo-storage. Box Dimensions (LxWxH) 14.0 x 8.9 x 2.1"
JBT-46 Ledger Bi-Directional Le Memo Album (Hunter Green) is rated 4.6 out of 5 by 10. Rated 5 out of 5 by Clarissa from Beautiful and sturdy They are a lovely blue color on the outsode, and the insides hold my photos exactly as I need. The way the pages are laid out, I can display the pictures horizontally or vertically, while still keeping them in the order I want them. The only negative thing I have to say about these, is that I ordered four of them, and when they're displayed spine out on the shelf, one of the spines has lettering that isn't quite centered. Which by itself would not be a big deal, except it is next to others that are correct, so it stands out. Again, not that big of a deal. I'm still glad I bought them. Rated 4 out of 5 by RedKitteh from Great quality, classic look I searched long and hard for a mid-priced photo album that would look nice on a bookshelf. This one fit the bill. It's not insanely high quality-a few of the pages got small tears when I was too rough with them. But the spines with the gold lettering look great on the shelf. One note: the cover is actually far more black than this image lets on. It's less marbled and old-school composition book look, and more subtly colored (which I like, myself). Rated 5 out of 5 by Jess from great photo album! I've been searching for the perfect photo album for awhile now and I finally found what I was looking for with these. They hold 300 photos, you can put photos in vertical or horizontal which is nice, they hold up well and look great on a shelf. I started with buying 5 and loved them so much I bought 5 more. They also come in a variety of colors as well. Rated 5 out of 5 by Drew from I will always purchase this product. This is the fourth album of its kind that I have purchased over the past five years. It perfectly meets my needs, as it includes an area for writing a description of the accompanied photo. Rated 4 out of 5 by family photo taker from Great Albums I have purchased many of these albums over the past 10 years. They are high quality and organize and preserve the pictures nicely. Rated 5 out of 5 by Samuel from Holds Up This one is my 15th of these albums. I have had these for a while and they hold up very well. How thick are these albums?